Modern Garden Roses. Modern Roses. Modern Garden Roses From The Grandifloras Onwards. Modern garden roses follows on from Modern Rose Types. So after crossing Polyanthas with Hybrid Teas to get Floribundas, the next obvious step was ..... to cross Floribundas with Hybrid Teas. And that's what happened. And they were called Grandifloras. The blooms may be simply one on a stem, or in small clusters, and they are halfway between each parent in bloom size. They are nothing compared to the Foribundas in numbers, but they are more vigorous than the Hybrid Teas. In the garden or as cut clusters, they are perfect. Grandiflora Shrubs Roses are unique. They are larger than either Hybrid Teas or Floribundas, and feature Hybrid Tea flowers borne in small clusters of three to five, similar to a Floribunda. The most famous Grandiflora rose of all is Queen Elizabeth which is in the Rose Hall of Fame. A truly magnificent rose. All of the beautiful Old Garden Roses had their miniature forms as well. But nowadays, due to modern breeding techniques, we find a huge array of miniatures grown in a class of their own. The Gallicas, Centifolias, etc, had miniature forms. These were only once-flowering as their parents were. But as modern gardening roses progressed from the Hybrid Teas to the Polyanthas, to the Floribundas and to today's roses, so did the miniatures. Today's miniatures are repeat-flowering and they will grow to about 3 feet, and there are climbing forms as well up to 6 feet or more. Lucky for us, they come in the full range of colours, shapes, and perfumes of their big cousins. It's so easy to add 'just one more' to your already cramped garden. This is where the patio comes in handy, or the window sill. Great for a window box. A word of advice: don't be like my Mum who thinks that because miniatures are so small they should be kept in little pots. She always keeps them in the same pots she bought them in and they never grow much higher so she doesn't need to put them in bigger pots. Climbing and Rambling Garden Roses. Just as most of the old garden roses come as miniatures, they also come in Climbers and Ramblers. These roses have stems which are more flexible than the Shrub Roses. This means: they can be trained. The unique rambling 'Ghislaine de Feligonde', above, is stunning and is Number 1 on my list of favourite Ramblers. In the old garden rose types, climbing and rambling were simply their natural habit - some old garden roses grew taller than others - but in the modern rose types, climbing and rambling are the results of spontaneous'mutations'. eg. Climbing Peace is a 'sport' of the 'Peace Rose'- a Hybrid Tea Rose. It is actually genetically identical except its canes are flexible (climbing). A 'sport' is a single blossom on a rose - or any other plant - which looks totally different. If we get lucky it can be bred into another variety of the original rose. The 'Peace Rose' has 'Flaming Peace','Lucky Piece' and 'Peaceport' as successful sports. Madame Alfred Carriere. My Favourite Of All The Climbing Roses. 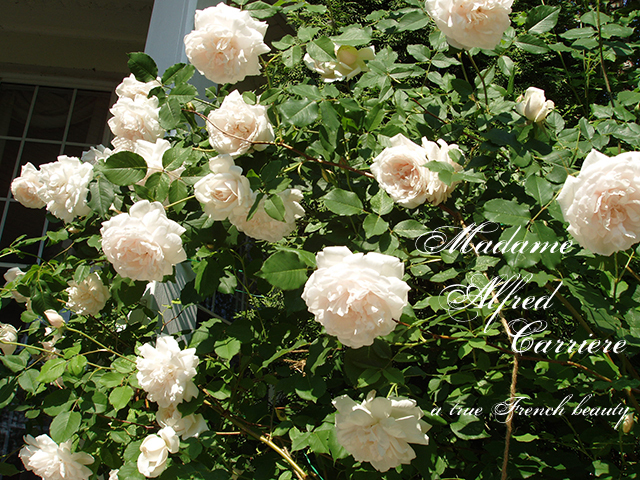 See Madame Alfred Carrriere on the Fragrant Climbing Roses page. Climbers and Ramblers are usually classed together, but they are actually distinctly different. Each belongs to its own unique group. Most Climbing Roses grow anywhere from 8'–20' in height and are repeat-bloomers; and Rambling Garden Roses can grow up to 30 feet tall,but are distinctively once-blooming. For example: 'Blaze' (repeat-blooming climber), and 'American Pillar' (once-blooming rambler). However, the amazing Rambler New Dawn is a repeat-bloomer. Stunning. One of the most vigorous climbing roses (which is actually a Rambler) is the Kiftsgate Rose, named after the house where it was noticed by Graham Stuart Thomas in 1951. This rose is claimed to be the largest rose in the UK, and has climbed 50 feet into a copper beech tree. Shrub roses were developed in the early 1900's. 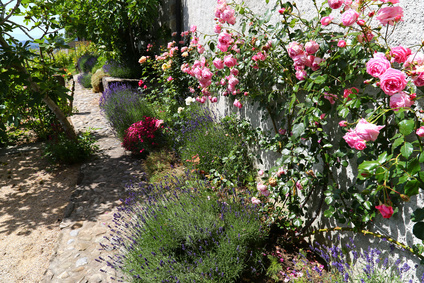 The beautiful Shrub Rose, 'Kathleen Ferrier' (left) is a good example of a beautiful shrub. Roses classed as shrubs tend to be robust and rather informal which is why I like them best. They grow only to a maximum of about 8 feet, so they can easily be 'let go', especially if they are at the back. They are great if you want a hedge or fence which doesn't have to be cut back as much as a climbing rose hedge would have to be. Wherever you have a gap which needs a certain 'something' which just doesn't suit any of the other rose types, then gardening rose shrubs are the ones for you. They come in so many different colours, sizes and shapes, that you can't go wrong. They are tough and hardy and look great with companion plants around them. Shrub Roses will delight you no matter where you put them. and when you run out of room in the garden, which is quite likely, you can grow them in pots. The superb David Austin Rose, 'Graham Thomas'.To get this rose he crossed 'Charles Austin' with the glorious Floribunda 'Iceberg' in 1983. To say 'David Austin Roses' is to say English Garden Roses around the globe. In fact, I'm proud to say that I once owned one. You can see my story of my Rosa "English Garden' on the David Austin Roses page. I had a lucky break which introduced me not only to David Austin Roses, but better still, to English Roses and, to roses as a whole. To own a David Austin rose is a privilege - to me, anyway. Austin, from Shropshire, in England, wanted to revive the interest in Old Garden Roses - by crossing them with the modern Hybrid Teas and Floribundas. There has been so much hybridizing that it can make your head swim quite bit if you get it all at once. 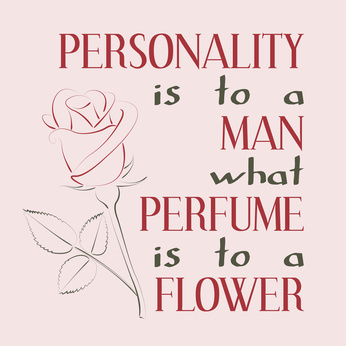 He has his own unique rose types which are world-wide favourites. David Austin wanted rose types which had the unique old-fashioned blooms, shape and fragrance, but had the qualities of repeat-blooming and a huge colour range. Well, he has certainly achieved that. And he is still at it, breeding award-winning roses time after time. Example: 'Graham Thomas', definitely one of his best. And in France, the Meilland Company has it's own version of the Austin English Roses. They are called Romantica or Renaissance Roses and they are very beautiful. The loveliest example of these gorgeous roses is Pierre de Ronsard. H. T. 'Mrs. Aaron Ward'. List of Pages About Modern Garden Roses. The Pierre de Ronsard Rose. Home. Return from to Modern Types of Roses.